Kristin puts on her knitwear designer cap and joins Shay to demonstrate a knitted wrap from her book Knitting Wrapsody (Interweave, 2011). 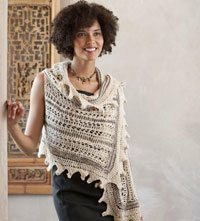 This wrap, called the Summit: American Yak Wrap, has a unique reversible lace stitch pattern and bobble edging. Sponsored by Bijou Basin Ranch. Get the entire Series 500 of Knitting Daily TV on a 4-Disc DVD Collection! Click here to purchase DVDs of this season or previous seasons of Knitting Daily TV.